Moving to a new home or area can be one of the most stressful life events you will encounter. If you have a dog at home, you can imagine how stressful it is for him or her as well. Between the ocean of boxes, the moving trucks, and the high-stress environment, it is important to understand how you can avoid some of the stress your dog will have during your move. We have asked our trusted Veterinarian, Dr. Jennifer Landers, for tips that may help keep your furry friend safe and stress free during the transition. 1.When choosing a new neighborhood, house or apartment, what are important features to consider for your dogs? (Space, other animals in the area, square footage). If possible explore or research potential new neighborhoods to determine if the area seems dog friendly and safe for you and your dog to walk there. Observe for unattended, stray or aggressive dogs. Investigate local zoning regulations and animal control laws. Some communities limit the number of dogs per household, ban specific breeds, and have other specific laws and policies regarding pets. Contact local government for details. Also check specifics on policies for pets if you are moving to a residential subdivision like a condominium, co-op or apartment complex. Many of these residences have stricter or different policies regarding pets. There may be breed, number or size/weight restrictions or other policies concerning pets. Communities and buildings that are “dog friendly” will be much easier to join. Regarding space at a new home, consider your dogs specific needs. If the size of the new home is much larger or smaller, it may affect his habits and lifestyle. For most dogs, indoor space is not an issue if they have ample opportunity for outdoor walks and exercise. For some dogs used to more confined living quarters, too much room can be overwhelming and he may need to be confined to a smaller area initially to adjust. Take into account your dog’s needs regarding walks. For older dogs, puppies and dogs with house training issues, these dogs will need to go outside more frequently and choosing an apartment on a high floor with a long elevator ride or lots of steps may be challenging. They may also prefer or require grass or a yard or will need to get retrained to void on pavement. 2.What are some ways to decrease stress while packing up your home? Most dogs aren’t big fans of change. 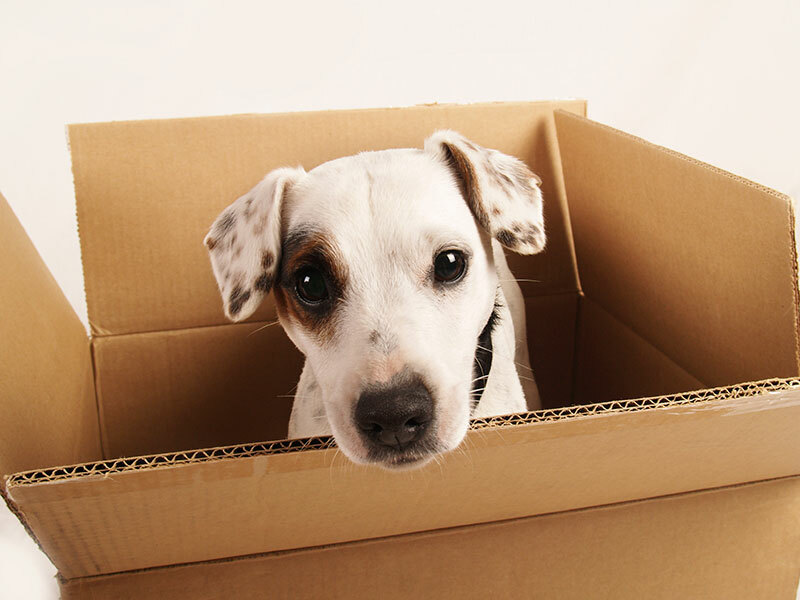 You can help your dog adjust to the moving process by bringing in moving boxes early, and by keeping your furry friends in a familiar room you plan to pack up last. If possible, relocate your dog(s) to a friend or relative during the move and especially on moving day. This way, they are out of the chaos and both you and your dog will be less stressed. If you can’t relocate your dog, on moving day keep your dog(s) in a quiet room with the door shut. Leave food and water with them and ask that movers and others helping that day keep the room off limits until you are ready to be with your dog. Dogs actually love nice cozy “dens”. If your dog is already crate trained and enjoys their crate, you can easily keep you pet confined during the process. If your dog is not crate trained, the weeks before a move can be used to get him interested and comfortable with one. This way, he’ll have a safe place to be for the packing and moving and also to go to for comfort in his new home. We know that moving is one of the most stressful events that a person can endure. Remember that your pet(s) can and will react to your emotional state. If you are anxious or stressed, this can make pets feel the same way. 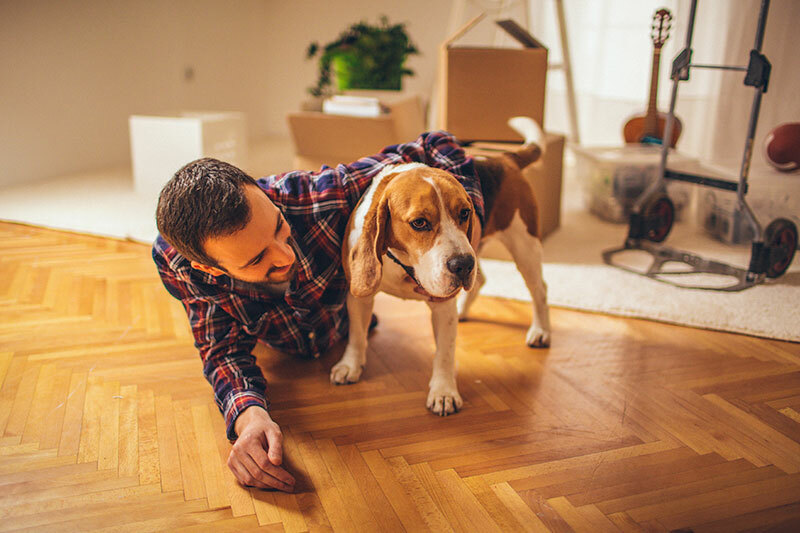 It can even bring on behavioral changes or physical symptoms in your pet, so be sure to curb your emotions and keep things as routine and comfortable for your pet(s) as possible during the packing and moving process. Spend some time reinforcing basic obedience commands with your dog. A dog that can focus on obeying a command is more tuned in to people and will be more likely to settle down during the packing and moving process. They may also be better equipped to deal with new surrounding and situations. 3.If we are planning on driving a long distance to our new home, what do we need to consider for our dog? It’s a lot safer for everyone if your dog is securely fastened or confined during car trips. Even if your dog loves car rides, he should be restrained. Popular options for safe dog travel include restraining harnesses (doggie seatbelt), crates and car barriers. Be sure to always put your dog in the back seat and never the front. Don’t let your dog stick his head out the window, he can be injured by particles of flying debris. If your dog doesn’t like riding in cars, consult your veterinarian about behavior modification or medication that might reduce the stress of travel. In this case, it may be best to use a carrier to ensure you and your dog’s safety. Some dogs experience car sickness and this is easily prevented with medication. Signs of car sickness include drooling, trembling, hunched posture or vomiting, Speak to your vet about motion sickness medication if needed. Never leave your dog alone in a parked vehicle in warm weather as the temperature can rise quickly and cause heat stroke. Many pets haven’t spent much time in crates or cars. In the weeks or months leading up to the big trip, you can prepare your pets by gradually acclimating them to their crates. First, place their food inside an open crate, and eventually have them eat their meals in the crate with the door shut. Try carrying your pets around the house in the crate or taking a short drive. You can help your pets develop a positive association with the crate by providing treats and playtime at the conclusion of crate time. Crates also become extremely comforting for the dog once in their new home. Pack a spill-proof water bowl, your dog’s regular food, any medications he takes and his favorite toys for playing fetch or tug. Bring some long-lasting edible chews and durable chew toys, too. Hollow toys you can stuff with food are ideal for quiet time in the car or hotel. Some dogs can get overexcited in the car and may whine, bark or pace. Using a crate, and possibly covering the crate with a blanket, may relax him. Make sure you have your dog eliminate before embarking on a car ride. An empty stomach is also a good idea. Be sure to schedule periodic breaks in your trip for walks, stretching and bathroom. If your trip is an overnight journey, be sure to plan in advance and find pet friendly lodging. Remember to make sure that your dog gets adequate time to run and play during the journey. 4.What do we need to consider if we are flying to our new home with our dog? Traveling by air takes advanced planning, try not to transport your pet by air unless absolutely necessary. Check with your veterinarian, the U.S. Department of Agriculture, and the airline if your pet will be flying. You will need to take precautions to ensure your pet’s safety. • Does the airline have any restrictions on transporting your dog as cargo? • Does the airline have any special pet health and immunization requirements? • Does the airline require a specific type of carrier? • Use direct flights to avoid transfer delays and mistakes. • Travel on the same flight as your pet. 5.What are the first steps to take once we arrive at our new home to help our dog get acclimated? Prepare your pet for the move a few weeks before the actual day. Pack over a period of time and try to maintain your pet’s normal routine. Buy a carrier that will allow your pet to sit and lie comfortably inside. If your dog is not accustomed to a pet carrier or crate, take the time to get your dog used to the new carrier before the move. A few weeks before your move, visit your veterinarian for a check up. Make sure that your pet is healthy and current on all vaccines, especially rabies vaccine which is required by law. Your vet can also provide a health certificate and vaccine certificate. If you are traveling nationally or internationally, there may also be special forms that are needed by the airlines or customs. If your move is far and you are changing vets, get a complete copy of your pets medical records to have for your new veterinarian. Talk to your vet about special needs your pet may have and address them. If he’s on a special diet or medication, make sure that you have enough of everything and/or written prescriptions for more. This is also a good opportunity to speak to your vet about how and when to use medications for motion sickness or anxiety. Microchipping, a form of permanent identification, is the most reliable way to ensure that you and your pet will be reunited if he is lost or runs away during the move or in his new neighborhood. Your vet can insert the chip at a regular visit and also help you get your pet’s microchip registered. As soon as you know your new address and telephone number, get a pet ID tag with the new information on it. Have your dog wear both ID tags right before and after the move to ensure that if your dog gets lost, you can be located. Even with a microchip, all dogs should ALWAYS wear collars with ID tags. Have recent photographs of your pet with you during the move, in case he is lost or runs away. Before the move, or soon after, be sure to locate a local veterinarian. Research your choices and ask your new neighbors about vet recommendations. You can even visit a new potential office to meet the front office staff and ask questions. Some pet owners may wish to bring medical records in to set up a relationship with the office, especially if their pet is on medication or special diet. Also find out the location and hours for the closest veterinary emergency hospital to have on hand just in case. Other things to scope out in your new neighborhood would be dog runs, dog friendly businesses and popular places to bring your dog. • Poison – cleansers, insect repellent, pesticides, medications, certain plants, and antifreeze. • Falling objects – look for precariously placed appliances and furniture. • Escape – loose screen and inadequate fences. When you arrive at your destination, open the carrier as soon as you are in a safe place and examine your pet. Spend some time playing with your dog and reassure him. You may want to offer a treat or a new toy so that your dog will associate the new place with fun. If anything seems wrong, take your pet to a veterinarian immediately. Set up your dog’s belongings so that he will immediately recognize the familiar items. With familiar furniture including his bed, crate, toys and food and water bowls, your dog should be able to settle quickly into his new home. Allow your dog to explore his new home and familiarize himself with the new sights and smells. Make sure that all doors, windows, and fences are secured so your dog will not accidentally wander away. Remove the old ID tag from your dog’s collar and make sure the new ID is secured on his collar. Try to maintain your pet’s normal routine as you unpack. Try not to disturb the location you have chosen for your dog. Having a secure place to go to is important for your dog in an unfamiliar place. Taking your dog out for a walk around the new neighborhood will also acquaint him to his new surroundings. Have patience and allow him to explore everything around his new home. You may want to introduce your dog to your new neighbors. Your neighbor’s familiarity with your pet may help in the recovery of your dog if he ever gets lost. Make sure to keep your dog on a leash when meeting new people. 6.From your experience, how long will it take for our dog to settle in to the new home? Every dog is different and this adjustment period can vary from a few days to a few months. Following preparation steps will help the transition go smoothly. Consistency is key - try to stick to your dogs routine as much as possible with feeding, walks and bedtime. Give your pet as much company and affection as you are able, even more than usual if possible. The stress of the move can be made more difficult if schedule changes or less companionship are compounding it. Make sure your dog also has all his usual things and especially his favorites. He’ll prefer his old stuff that smells familiar to anything new. Same is true for diet - the first few days in a new home isn’t a good time for dietary changes. Walking through the new neighborhood will also help him familiarize himself, so explore together. It’s not uncommon for a pet to develop behavioral changes, changes with appetite/eating or with going to the bathroom, or other things like barking or hiding. These changes should be short lived and resolve themselves relatively quickly. Get help from your vet or another professional if your pet is having trouble adjusting, especially if he is developing undesirable behaviors or habits. Thank you to Dr. Jennifer Landers for the tips! Stressed about moving with your Dog? Read our 5 Step Guide to Relieve your Moving Stress with advice from stress management experts.